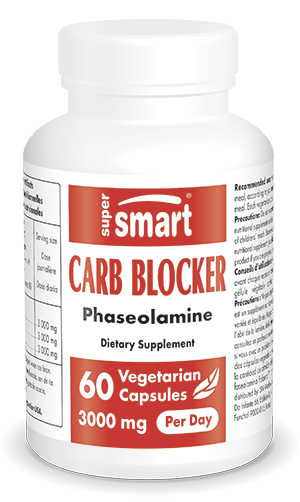 Carb Blocker contains phaseolamine, a natural extract of the kidney bean (Phaseola vulgaris) which inhibits the enzyme alpha-amylase. This enzyme digests the starch in food and converts it into glucose. Phaseolamine helps to neutralize ingested starch, which is important for diabetics as well as for those trying to reduce or control their weight by following a low-carb diet. ¤ Two capsules of Carb Blocker provide one gram of phaseolamine which has been shown in vitro to help neutralize 2,750 calories of starch (around 600g of spaghetti for example). Its efficacy has been confirmed by two in vivo studies: in one, individuals supplemented with phaseolamine lost almost 3.5kg in one month, while those given a placebo lost less than 500g. In the second, absorption of starch was reduced by 66% in those supplemented. ¤ Fabenol™ phaseolamine is obtained from non-GMO plants. It has no stimulant effect. Each gram of Fabenol™ inhibits 8,000 units of amylase - that's 1,500 more units than the previous formulation of this product, representing an increase in efficacy of over 20%. Each vegetarian capsule contains 500 mg phaseolamine Fabenol™. Take one or two capsules just before eating, according to your needs and the amount of starch contained in that meal.